Up to 68 inputs, with 8-monitor/114-window outputs. 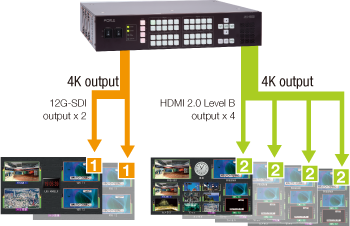 Simplifies 4K workflows by accepting mixed input, including 12G-SDI. 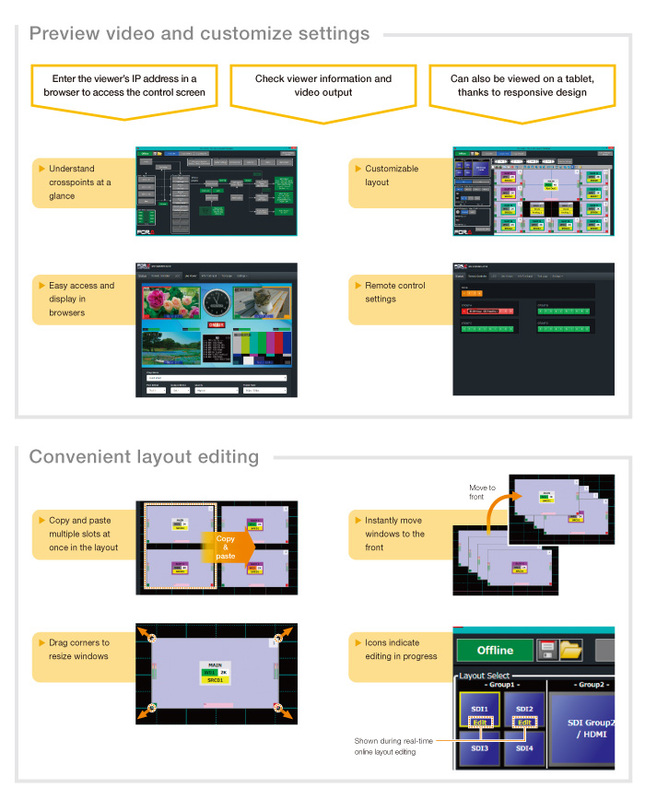 Layouts for each output can be freely customized. Provides up to 68 inputs and 8-monitor/114-window outputs in a 2U enclosure. Add up to 3 optional cards. Combine optional input cards, MV-4200SDI (3G/HD/SD-SDI, Composite x 20), MV-4200PCI (DVI-I/HDMI/RGBHV x 8), MV-4220SDI (12G x 5 or 3G/HD/SD-SDI x 20), or the optional MV-4200IF interface card (GPIO, serial control, input of analog audio, AES audio, genlock), as needed. 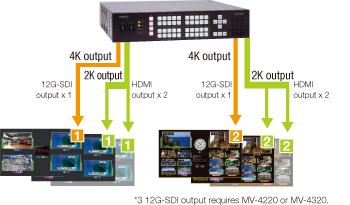 *3 12G-SDI output requires MV-4220 or MV-4320. Four input signals assigned to crosspoints 1 to 4 can be controlled together. 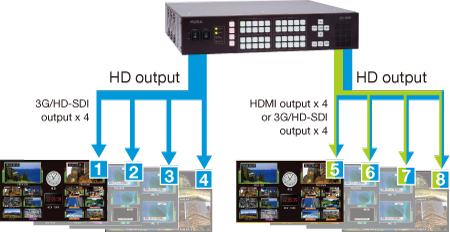 In mixed HDR (HLG format*4) and SDR environments, the convenient HDR/SDR conversion features enable easy monitoring of video near the original luminance and saturation, regardless of the type of monitor used. View HDR material on SDR monitors at near-original brightness and saturation*5, instead of the dull, flat display that SDR monitors normally produce. View SDR material on HDR monitors at near-original brightness and saturation*5, without any excessive brightness or saturation. 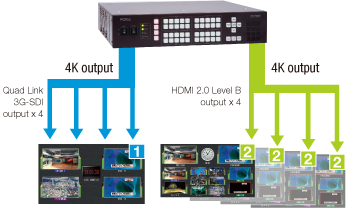 SDR-based graphics created in multi viewer such as titles, tallies, clocks, and level meters are converted for display on HDR monitors. This prevents overemphasized multi viewer graphics on HDR material. *4 HDR support is restricted to Hybrid Log-Gamma format. *5 Basic conversion for convenient viewing. Brightness and saturation differ from the original material. Windows-based screen layout creation and management software. Customize layouts using the software to adjust image size, position, title display and other settings. Store up to 68 layout patterns on the multi viewer. Saved layouts can be recalled directly from the front panel control. Enables monitoring 4K footage on an HD or PC monitor. Supports quad-split screen of 3G-SDI input. 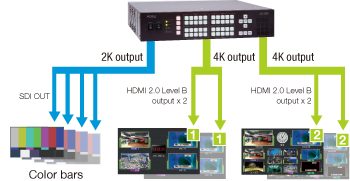 The MV-1620HS is a multi-viewer that supports mixed inputs of 3G, HD-SDI, SD-SDI, and analog composite signals. Up to 32 inputs with 4-screen outputs.